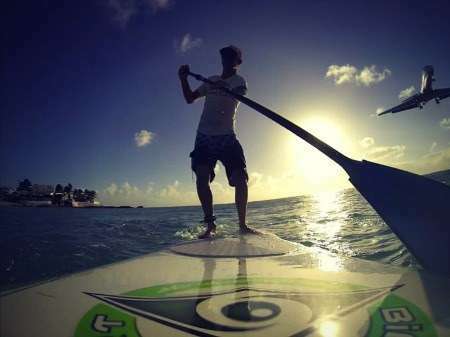 There?s no doubt that paddle boarding has become one of the most popular sports in recent years, known for the exceptional workout it can give coupled with all of the fun you can get. With so many people now enjoying this amazing sport, you?re probably wondering where you can get yourself a quality board and get started. The problem with so many stand up paddle boards today is that they lack durability, and especially when you?re shopping for a beginner board. Just because you?re new at the sport it doesn?t mean your board should be flimsy, and if anything the opposite is true. Beginners at stand up paddle boarding need the extra protection of a durable board and should settle for nothing less. BIC is one of the most trusted names for a number of products in this country, but their range of sports gear for the water is where they have excelled recently. Their Dura-Tec range of paddle boards are perfectly designed to suit the needs of beginners with their shape and material, but with the toughness that you need in water sports equipment. 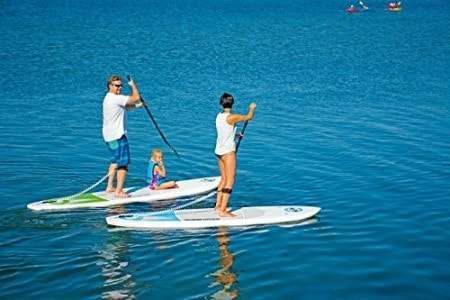 Whether you?re looking for a board just for yourself or the whole family, this quality and durable stand up paddle board from BIC is a great choice. It comes with the guarantee of the BIC name behind it so you know it will last for many years as you learn to love this water sport. Chances are if you look around your home, you?ll find a product with the BIC name on it, but did you know that they also made some of the greatest water sports equipment too? 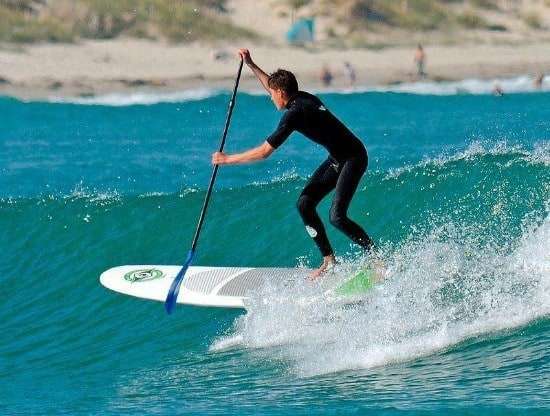 BIC has a quality range of stand up paddle boards to suit all types of riders, conditions, and performance, and their Dura-Tec board is definitely one of their best. This board has been specifically designed with beginner boarders in mind, so if you?re new to the sport and looking for a simple but quality board to get started on then you?ll want to consider the BIC Dura-Tec Stand Up Paddle Board. All of their boards are made to be user-friendly, so you can be sure that this is the easiest way to learn. When you purchase a BIC Dura-Tec Stand Up Paddle Board, you?ll be getting one of the most durable boards available. With a tough polyurethane shell and a stable polyurethane core, there isn?t much that can break this board. With everything you need to get your stand up paddle boarding passion started, the BIC Dura-Tec is a one of a kind. There?ll be no need to get any extra accessories or bits and pieces, which makes it ideal for beginners who want the complete setup. One of the coolest things about the BIC Dura-Tec board is that it comes in all different sizes so you can purchase one just for kids. Too many boards these days claim that they?re ideal for the family, but BIC actually delivers on this promise with their children sized boards. Although this is marketed as one of the more durable boards, that doesn?t mean it?s exempt from getting the occasional dent. Keep in mind that BIC boards have been made to be tough, so the dents are only on the exterior and this won?t affect how well your board works, but if you want something that stays smooth and free from bumps you?ll need to look elsewhere. If you?re looking for a light board that?s easy to travel with on foot, the BIC Dura-Tec stand up paddle board is it. Not only is it lightweight, but it has ergonomic handles built in so you?ll be as comfortable as ever carrying it over long distances. When you want to purchase a quality stand up paddle board to get into the water right away, the BIC Dura-Tec Stand Up Paddle Board is the one for you. With sizes to suit kids and adults, you can get all types when you shop through Amazon. For around $680 you can get the adult sized board which is far cheaper than you?ll find other brands for, and with the trusted BIC name on them. Amazon will also gladly ship your board straight to your doorstep at no extra cost, so you can save hundreds on the freight cost. However, if you?re lucky enough to be an Amazon Prime member you won?t pay a cent and it will be delivered with their express service which means you?ll be out on the water within just two days. To keep you covered from scratches and dents, you might want to purchase a stand up paddle board cover that will allow you to keep it safe. Because the board comes with attachment points for securing your gear, there?s no need to purchase anything else if you want to attach it to your car and head off into the water. BIC has succeeded in making one of the most durable boards, not just for beginners, but for all types of users. Whether you?re a small child or a professional adult, there?s something unique about this board that makes it the right choice for everyone. To purchase the BIC Dura-Tec Stand Up Paddle Board for a discounted price and get out onto the water and into your new passion. With just one product, you?ll gain a new lease on life, be fitter than ever, and have something fun and worthwhile to fill your weekends with.